First tasted at the Farr horizontal in January 2003. Deeper than 1995. Nose is closed. Tobacco and wood with a touch of liquorice. Fine definition. Very concentrated palate - full-bodied. At an adolescent stage. Earthy/cigar-box notes. Quite austere on finish. Vin de garde. Very fine indeed. Then at the Lafite vertical in November 2005. Opaque purple/black colour. Just an incredible nose: blackberry, roasted herbs, pain grille all with brilliant definition. Absolutely stunning. The palate is very backward with firm, masculine tannins. Perfect acidity. Dense, earthy black fruits, minerals with a touch of black truffle developing. Incredible concentration and a perfect wine that marries power and finesse. Very complex. Brilliant, but a long-term wine. Leave it 10 years or more. Last tasted in September 2006 when it was just a little more herbaceous than I expected. Very dark blackish red, narrow rim, just starting to brick; dense, concentrated, relatively closed, but with a clear, persistent, mineral infused blackcurrant Cabernet; crisp and fine and complex to smell; richly concentrated middleweight wine with a fresh acidity and a particularly refined tannin texture; lovely ripe but restrained cabernet fruit, scented and subtly minerally; very poised, effortlessly long and graceful and with very persistent, mineral infused length; a slightly bigger wine than the Margaux (a slightly thicker artists brush? ), but with all its finesse and scope, and just a little more flesh. 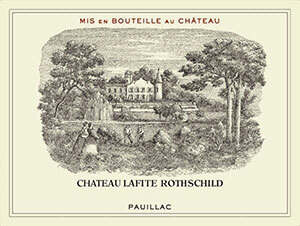 Great taffeta fine Lafite in the making, with enormous delicacy and pronounced scent. Classic. Almost approachable, because so harmonious and so beautifully textured. A copybook example of fine, rather than stressed, excessive winemaking. Not big, but so much class and complexity and perfume. Drink 2012-50+.